I grew up in Central Pennsylvania, in the midst of lots of Amish farms. Horses and buggies frequently slowed traffic on the road into town. On summer Wednesday mornings we’d go to the Amish market in Belleville, meander through all the livestock barns, and come home with apple butter and blueberries and a week’s supply of half-moon and Shoo-fly pies. We were occasionally invited to a nearby farm for a visit — and I remember on one occasion, when we arrived at the Yoders for dinner, that the whole house smelled of stewing tomatoes. “We’re making ketchup,” Ms. Yoder said. The idea that people actually made their own ketchup was quite astounding to me (even though we did our fair share of pickling and canning at home each year). 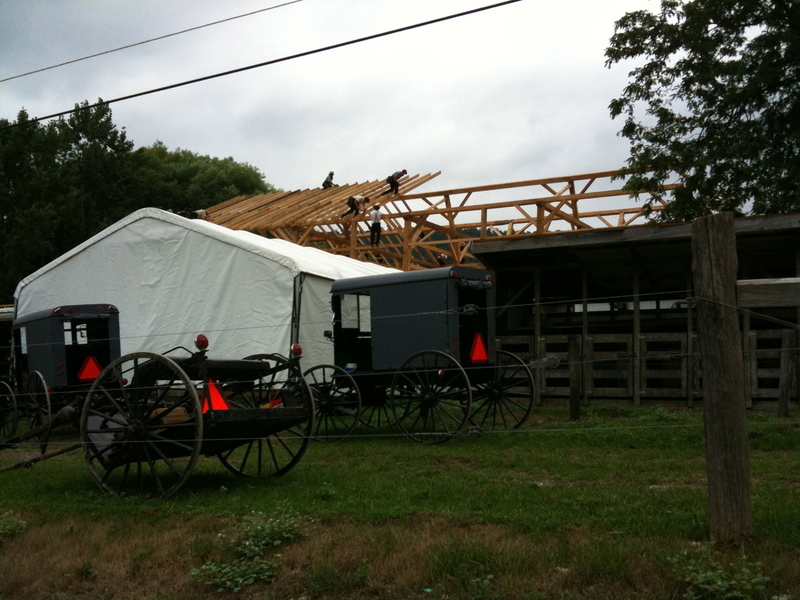 Yet in my 21 years in Centre County I never had the opportunity to experience one of the most mythic of Amish rituals: the barn-raising. This was my chance. I’m here visiting my family this week, and it just so happened that my grandparents had been invited to stop by the Stoltzfus family barn-raising today. I asked if I could come along. We arrived mid-morning to find the building mostly framed. Roughly 30 boys and men, representing all ages and a beautiful variety of shirt colors (even when I was little I admired the “berry”-colored fabrics they used to make their homemade clothes), had traveled from near and far to pitch in. Meanwhile, the women were busy preparing lunch, while the kids wandered about or bounced on trampolines in the back yard. The foreman, a master-builder from York, Pennsylvania, had cut and notched most of the beams at home before transporting them upstate. He apparently had created plans for the project but accidentally left them behind. It made no difference; he had led many such projects before, and the plan was undoubtedly stored securely in his memory. He expertly led his corps of workers, many of whom admitted that this was their first barn-raising, too. The posts and purlins fit together with mortise and tenon joints, and were secured with wooden pegs, all pre-cut by the foreman in York. This is pre-mod pre-fab. 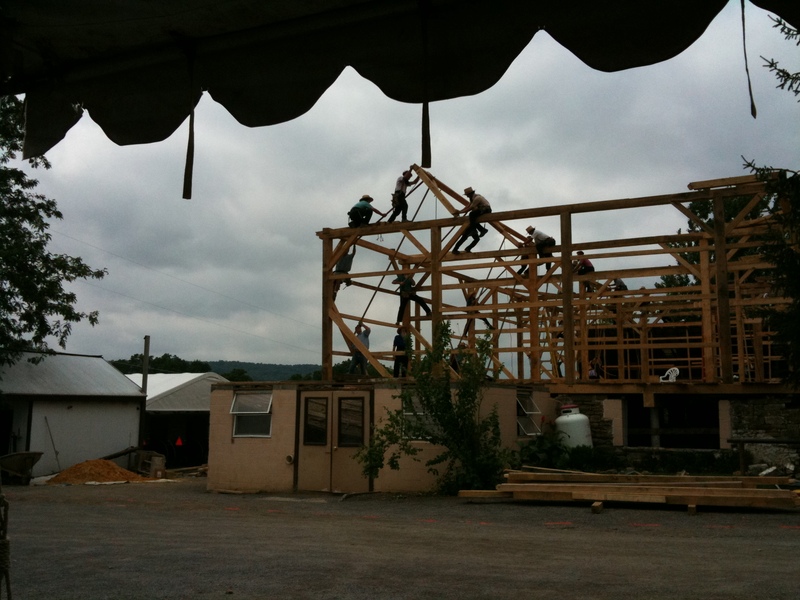 After lunch, half the men perched themselves atop the frame, and, at the foreman’s cue, swung the rafters into place. 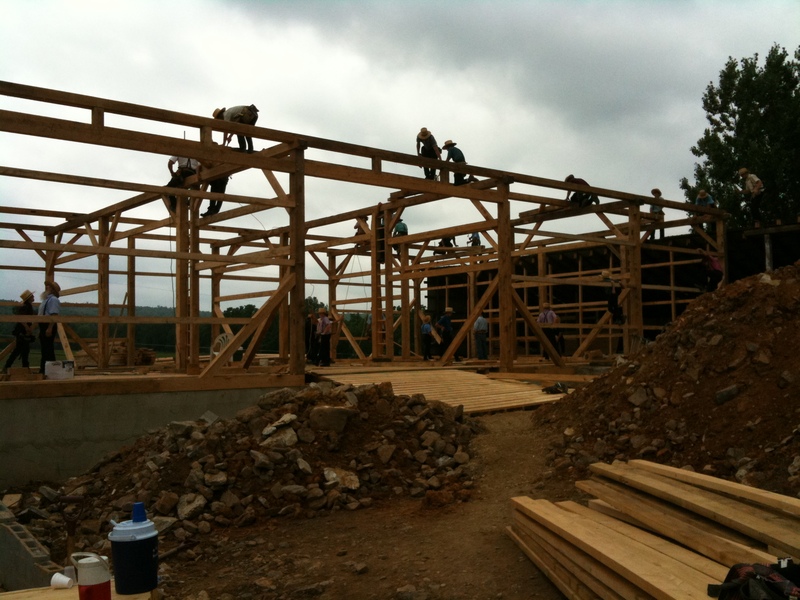 Then a boy on the ground handed more purlins up to the men up-top, who laid them across the trusses and secured them with more wooden pegs. We had to leave by mid-afternoon, but Ms. Stoltzfus predicted that they’d have the roof on by nighttime. “We wish we had more here. Usually, there are 80 men working on something like this,” she told us over lunch. Even with a half-size work force, their skill and speed were quite amazing. 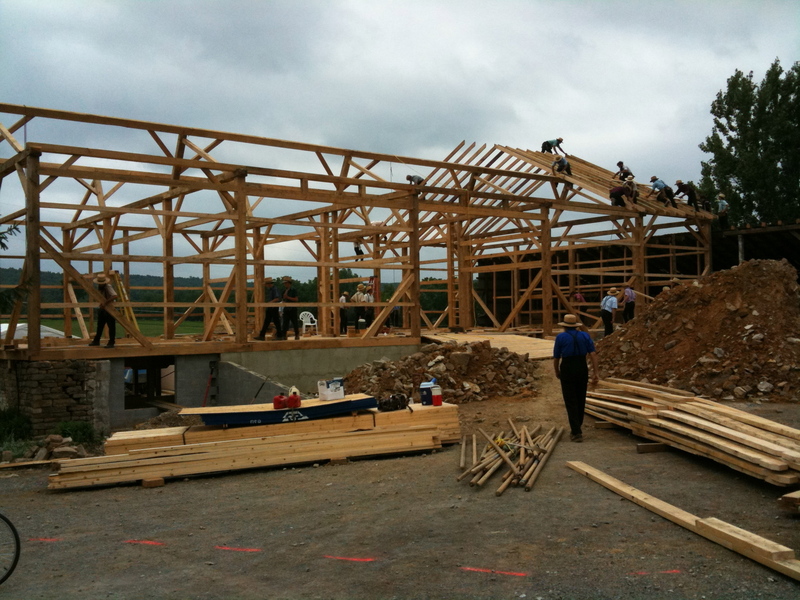 And I can’t ignore how integral the women’s contribution — and the full-family nature of the project — was to the whole affair, which is not only about building a barn. It’s just as much about reinforcing a community.